I need to save my development work as a Feature but I also need content editors to be able to edit the text. But I don't want to give them permission to edit all blocks. In the not too distant future, the site will be extended to another region so this content will also need to be translated. Is there a technique / solution designed for housing this data? I could create a new content type and create a new field for each piece of text. I could easily print the field in TPL files but it might be a little harder to print it in blocks. I also don't know if its performance inefficient to do this, does the whole node object get loaded when you print a single field? I've heard about (but not used) the Nodeblock module. It looks like this would work but I don't know how easy it will be to work with the Features module (I don't think you can feature nodes). One nice thing about the first method is that the field label could be descriptive eg "Footer legal text" which would make the translation side of things easier. Think of a Bean as a method to provide new types (compared to node this would be a content type) which then provides an add content interface to create as many blocks as you require (see screenshot below). The bean content can then be placed around the site just like any other block. If you'd grant content editors the appropriate Bean permissions, it appears to me that you might be close to a possible solution to what you're looking for. The video tutorial Drupal Bean module tutorial - using Bean Admin UI provides a great introduction to really understand the power of this module, and the kind of things you can do with it (by only using site building techniques, no custom coding involved). It also shows how the Bean module transforms Drupal blocks into fieldable entities. You can make custom block (structure > blocks > add block), or you can make a new custom menu (structure > menus > add menu) and keep it in the region your want to by navigating to (structure > blocks). To create custom regions, visit: https://www.drupal.org/node/1088718#comment-4194802 How do I create custom regions in a theme? I am suggesting to create one block.have you tried with the same.? Like, in block's body, just put the html of whatever you want to put throughout the site. and enable this block in footer or header which will be available through your site. I guess this will solve your problem. From what I get you need to grant some privileges to a specific block not all of them to some users or rolls. To do so I recommend you to use block_access module. This module adds a set of global permissions for creating, viewing, moving, enabling, disabling and configuring blocks as well as permissions at the individual block level. These permissions only affect the admin interface, front-end view access is handled in core. 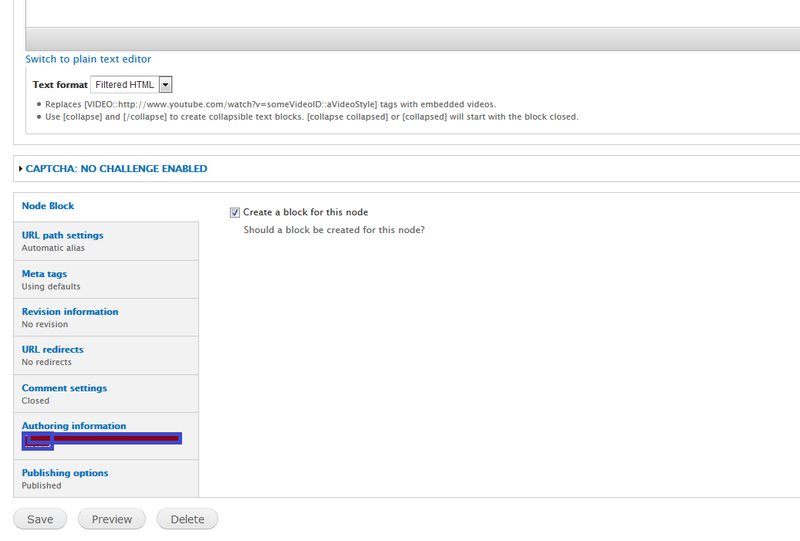 You also need to check the Patch against block_access-7.x-1.x to allow configuration of access settings per block. more discussion of this module is in How to use Block Access with specific Block? The NodeBlock module is very easy to use and easy to implement. So, content editor can easily edit the block same way as any other page. 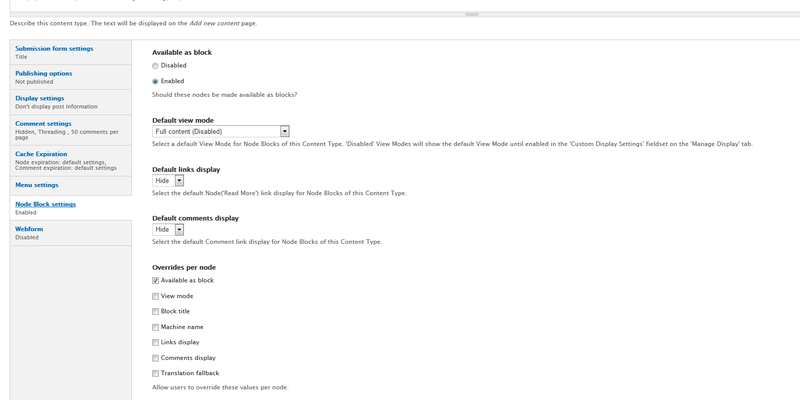 You can apply Nodeblock in you content type which you wanted to make it as a block like showing in a picture. If you want to give editing access for just one page then you can use "Nodeaccess" module. Not the answer you're looking for? Browse other questions tagged 7 blocks features or ask your own question. How do I create custom regions in a theme? How to use Block Access with specific Block? How to keep content out of features? How to add newsletter functionality (just stable modules if possible)? Allowing simple footer customisation in settings? How to Fetch/Load a Node form using jquery/ajax? How do I add Bean content to solr? How may I allow users to embed a view within a CKEditor text field? show all the blocks added to the particular page?